When the winter frost melts and the temperature starts to rise slowly, Spring comes to South Korea with the warm air and the thousands of blooming flowers. In order to enjoy the beautiful spring in Korea, which has recovered its vitality through overcoming the cold winter, it is recommended to visit the following listed places. Everland, Korea’s largest theme park located in Yongin city, is going to hold a Tulip Festival at the beginning of Spring for 44 days until April 28, 2019. At the Tulip Festival, not only tulips but various Spring flowers including Daffodils and Muscari will be all over the Everland. This year, various cultural experience contents with a theme of flower and art will be presented, and public performances such as parades and fireworks are renewed. In this festival, theme garden, an art exhibit and brick experience, motivated by Mondrian, a 20th-century abstract painter from the Netherlands, a representative country of tulips, will be exhibited. Four Seasons Garden, the main stadium of this festival, about 10,000 square meters, will express the vivid paintings of Mondrian with the tulips of primary colors. In the Four Seasons Garden, 20 different species of rare tulips, including the Black Parrot, which resembles a parrot wing, and a Happy Family, which makes a family reminiscent of blooming flowers in a single stem, will be shown. Changgyeong Palace, a presidential palace for the Queen and concubines of the Joseon Dynasty, is an ideal place to explore Korea’s history and learn more about its traditional architecture. 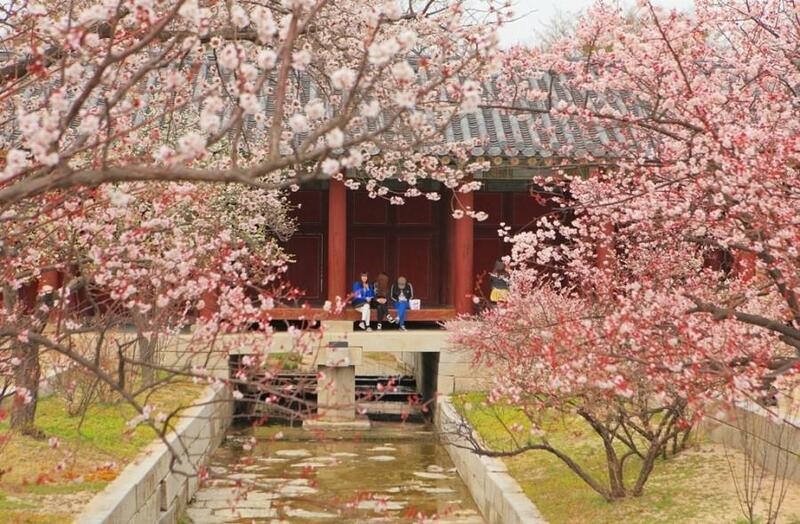 It is also one of the best places to enjoy spring flowers in Seoul, the capital city. Cherry blossoms, plum blossoms, Korean bush cherry, Korean dogwood flowers, apricot blossoms and azalea blooms in Korean traditional buildings gives an opportunity to get a picturesque Instagram photo. If lucky, the sight of the cherry blossoms’ snow falling over the Ockcheon Bridge in the palace will be shown in front of the eyes. Icheon has become a popular spring destination in recent years thanks to the vast habitat of the Sansuyu (Korean dogwood) tree. This very old wild tree boasts bright yellow flowers and is abundant throughout the city. Especially, it is inhabited in a tranquil area called Baeksu-myeon, which is also called as sansuyu village. The Icheon Sansuyu Flower Festival is held every spring. Photographers who want to take perfect pictures and many tourists who want to enjoy the landscape of Korea attend this event.